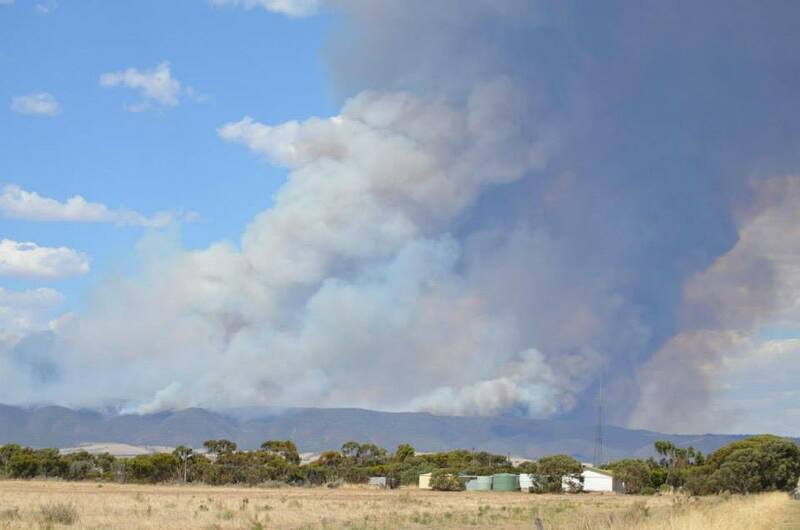 The Bangor fire in the southern Flinders Ranges continues to burn out of control. It has now been burning for 23 days, and has burnt nearly 33,000 hectares. The fire has destroyed a number of homes. It is currently threatening the townships of Laura, Gladstone, and Beetaloo Valley. This fire has impacted on the Telowie Gorge Conservation Park and also SOTA summit VK5/ NE-065. The Telowie Gorge CP is home to a colony of yellow footed rock wallabies, so lets hope they have survived the fire, and not suffered the same fate as some other fauna in some of the other recent fires in South Australia. The Telowie Gorge CP has been closed until further notice. I operated from the Telowie Gorge CP mid last year and it is / was a beautiful park, with an excellent walking trail through the gorge. Photo courtesy of the CFS Facebook page. The Bluff, VK5/ NE-065, has also been impacted. I activated this summit last year as well. The summit is located just to the south of Wirrabara Forest, which has been devastated. Of late I have been experiencing lots of problems with SOTAGoat. It appears that this has been since I upgraded to IOS 7.0.4 on my iPhone. And I have read on the SOTA Yahoo group that others have been experiencing the same. 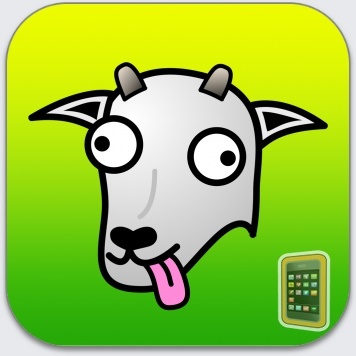 The problem is mainly that the goat does not bleat anymore to alert me of spots. However at times when it has been working, I have been receiving duplicate notifications. I have found that if I delete the SOTAGoat app, and then turn the iPhone off and wait a few minutes, and then turn the i-phone back on and reload the apple, that the spot alerts come through. But they only work for a short period of time and then stop again. I have sent off an e-mail to the developer, Rockwell Schrock, who was kind enough to respond promptly. Rockwell advises that the duplicate alerts should be resolved now. However, he has not been able to pinpoint that problem yet. Rockwell would be keen to hear from you if you are experiencing problems. His e-mail address is….. This morning my wife showed me an article in The Advertiser which was entitled ‘Rare birds wiped out by inferno‘. I have attached a copy below. In essence it talks about the possible geographical extinction of two South Australian birds, the Mallee emu wren, and the Black eared Miner as a result of the recent bushfires. Very sad indeed ! Article courtesy of the Adelaide Advertiser. 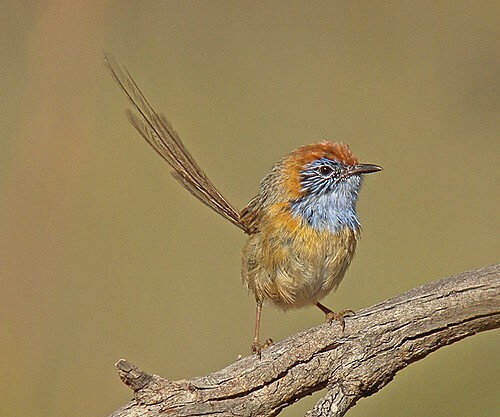 The Mallee emu wren is one of three species of the genus Stipiturus, commonly known as emu-wrens. The common name of the genus is derived from the resemblance of their tails to the feathers of an Emu. They are a tiny bird weighing just 4 – 6.5 grams. It is a Nationally endangered species and is restricted to open mallee woodland with spinifex under storey in north western Victoria and south eastern South Australia. It was estimated that there were just 3,000 of these birds in the wild. Ironically, back in 2008, the International Union for Conservation of Nature (IUCN) elevated the bird’s status from ‘vulnerable’ to ‘endangered’. The IUCN warned that the species ‘hold was so fragile that a big bushfire could wipe it out‘. Sadly their predictions appear to have come true. Due to recent fires in both South Australia and Victoria, it is believed that just a small pocket of these birds now exist in the Murray Sunset National Park in Victoria. 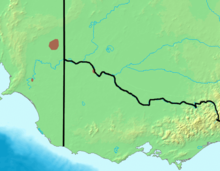 Map showing the distribution of the Mallee-emu wren, courtesy of Wikipedia. Click on the link below for more information on the Mallee-emu wren. 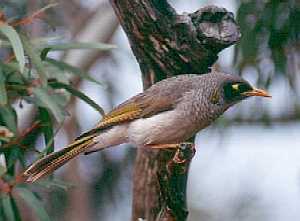 The Black-eared Miner is an endangered honeyeater which is endemic to the mallee woodland area of south eastern Australia. BirdLife International identified the following sites as important areas for the bird: Riverland Mallee (including Billiatt Conservation Park), & Ngarkat Conservation Park in South Australia, and Murray Sunset National Park, Hattah-Kulkyne National Park, Wyperfeld National Park, & Big Desert in Victoria. Due to the bush fires in Victoria, only a small pocket of these birds now exist in the Riverland region of South Australia. Click on the link below for more information on the Black-eared Miner. The Advertiser, Saturday February 8, 2014. Following the recent fires in South Australia, a number of South Australian National Parks and Conservation Parks have been severely impacted. An estimated 450 bushfires engulfed parts of South Australia during the January heatwave, burning more than 445,000 hectares, as well as destroying livestock, and at least 15 homes and about 24 sheds. About 200 farms were affected which included lost machinery and fencing. More than 1,700 livestock perished during the fires. The total damage bill is estimated to be about $10 million. And the loss to flora and fauna is unmeasurable. 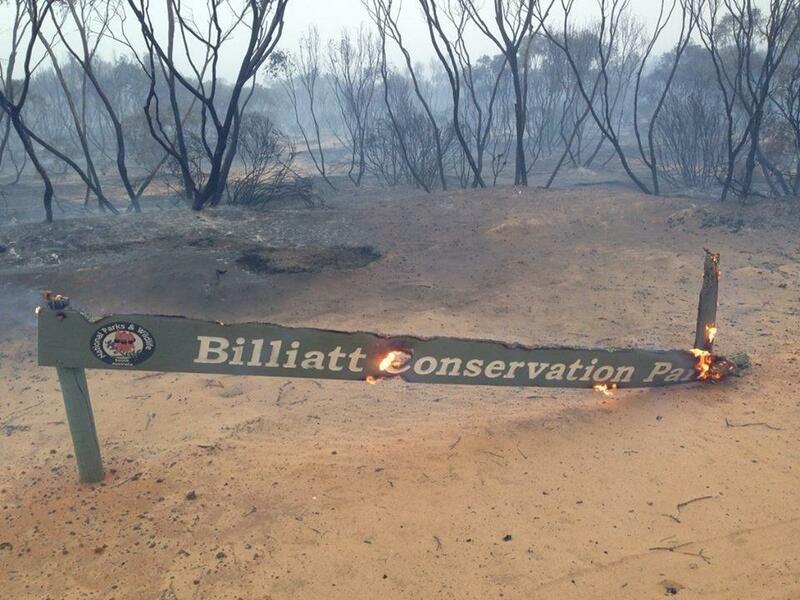 Billiatt Conservation Park has been totally decimated. It is literally ‘gone’. The status of the Billiatt fire is listed on the CFS website as ‘Controlled’. 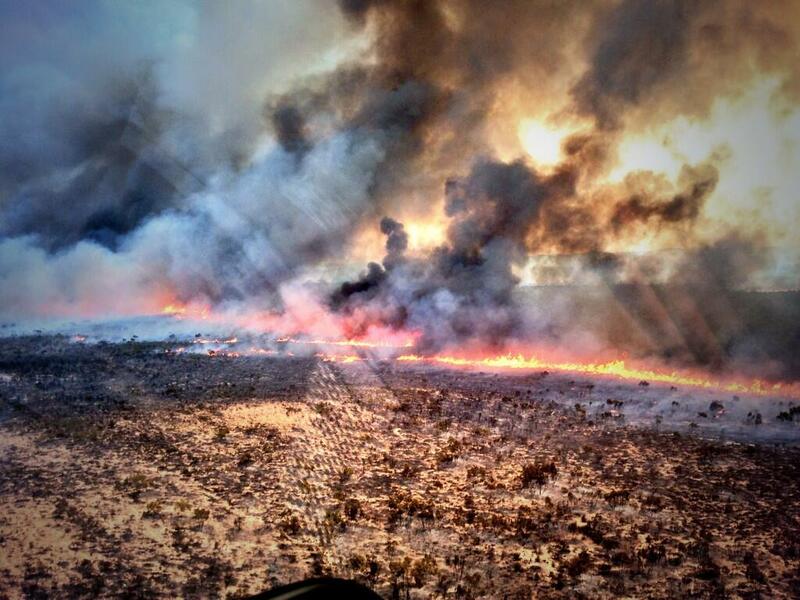 It is reported that the fire ‘continues to burn with control lines’. The fire has been burning since Wednesday 15th January, 2014. The park is closed until further notice. Two homes have been destroyed in this fire. 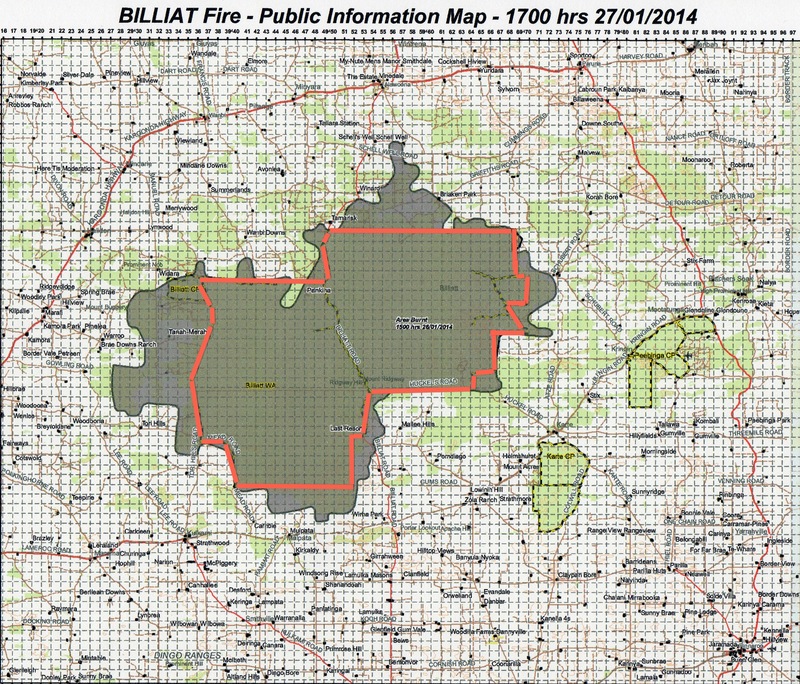 Below is a CFS map of the Billiatt fire. I have placed a red line indicating the Billiatt CP boundaries. As you can see the park is no more ! Map courtesy of the CFS. 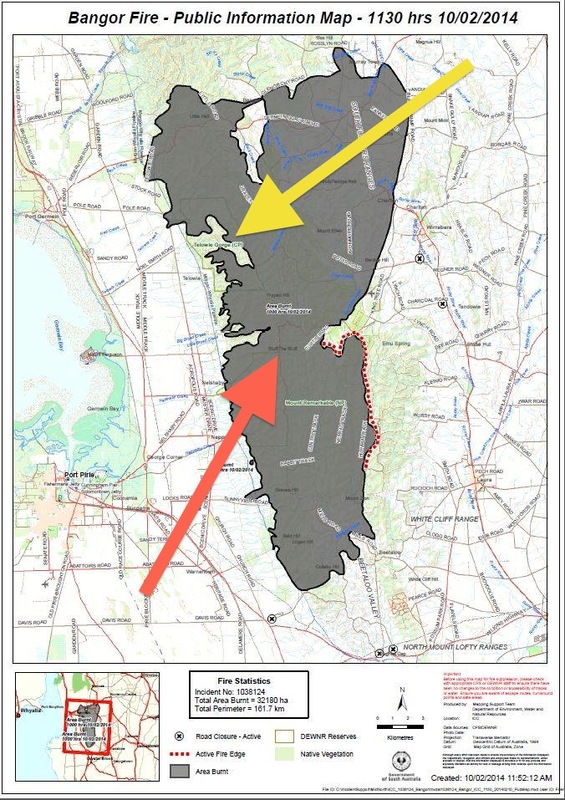 The nearby Ngarkat Conservation Park has also been significantly affected by fire. The fire which was started after a light strike, has burnt out an area of more than 90,000 hectares. The park is closed until further notice. 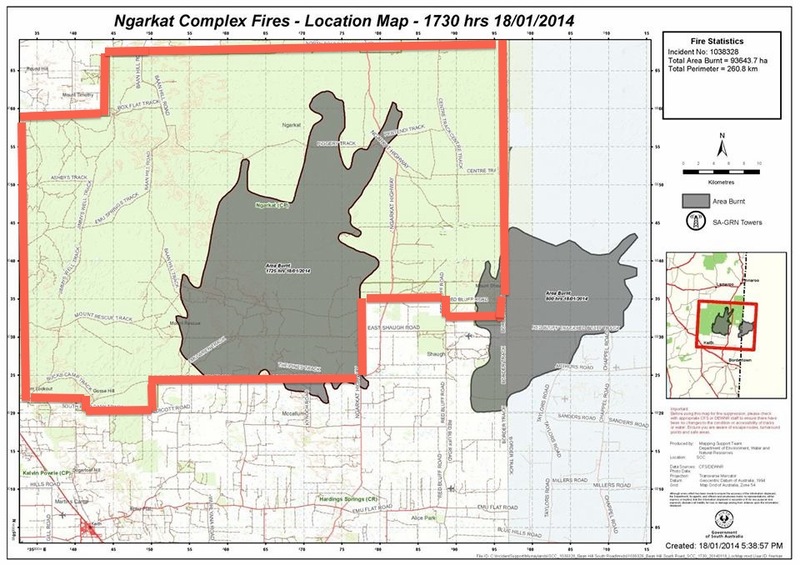 Below is a CFS map of the Ngarkat fire (dated 18/1/2014 – cannot get a more recent one). 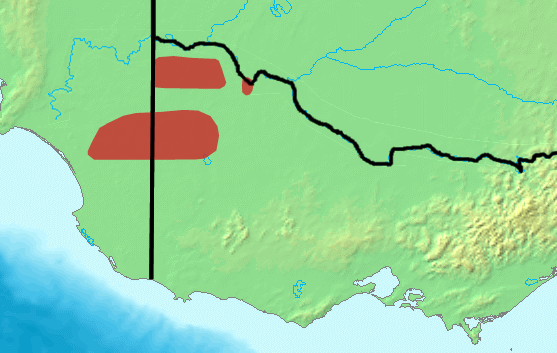 I have placed a red line roughly indicating the Ngarkat CP boundaries. As you can see, more than 1/3 of the park has been destroyed. 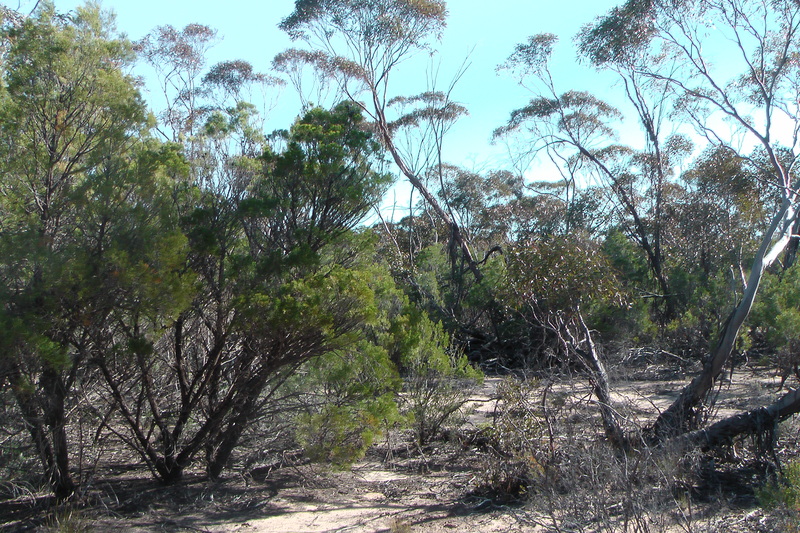 Both Billiatt and Ngarkat Conservation Parks have been identified by BirdLife International due to their importance for the conservation of numerous rare and endangered species of mallee birds. They are also the home of various endangered animals including the Western Pygmy possum. Not too sure how many are left after these fires ? Trees for Life are reporting ‘shelter for fauna is gone, shade and food now elusive, fauna losses extensive’. I activated both Billiatt and Ngarkat in September last year, and it is incredibly sad to see the state that they are in at the moment. The following parks have also been affected by the recent fires….. 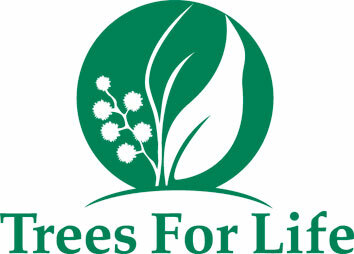 In conjunction with Ivan VK5HS, I am currently working on a possible fund raiser / raffle, where money raised would go to Trees for Life. Once I finalise this, I will let everyone know. There will also be future tree planting days, which amateurs may want to get involved in. Click on the link below to have a listen to local farmers Chris Bullen and Robyn Verrall who have a farm on the border of the Ngarkat Conservation Park.